Free Shipping Included! FLAGPOWER Portable Wireless Apple Watch Magnetic Charger, [Apple MFI Certified] Pocket Sized Keychain for Travel, Built in Power Bank for iWatch, Compatible with Apple Watch Series 3/2/1/Nike+ by FLAGPOWER at Kode Fu Guru. MPN: FP3C-001. Hurry! Limited time offer. Offer valid only while supplies last. FLAGPOWER Smart Keychain Power Bank instead of your Apple Watch Magnetic Charging Cable, adopt microcomputer electronic systems reach wireless charging for apple watch that depends on touch, just put your apple watch on the white magnetic set for charge. Built-in 700mAh Li-Polymer battery pack, charge Apple Watch up to 2 times! No longer has to care about your Apple Watch is out of power. Patent design, ABS and metal shell provide the best visual and haptical experience. Ultra Compact Size and Lightweight---Half credit card size (53.06(L)*39.9(W)*18.2(H)mm), and weight only 51g. 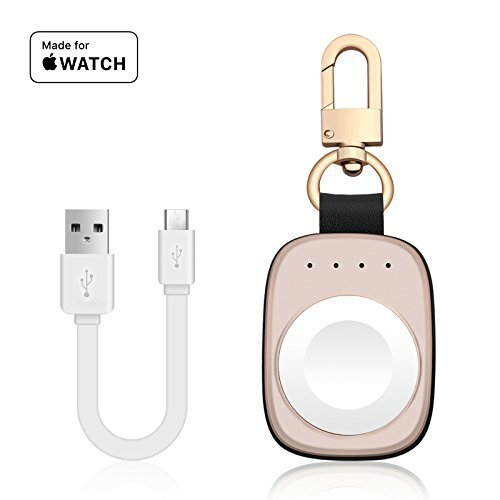 Portable---Keychain Design, you could use the Apple Watch Power Bank to hang it from your bag or backpack. Guaranteed Safety: Premium construction and circuitry with CE, FCC & RoHS certification protect you and your device. Support 3 Year Warranty, 60 Days Money Back!